Erivum Puliyum: Kaya Pola | Egg-Plantain Cake(Step by Step Pics) & New Year Wishes !! 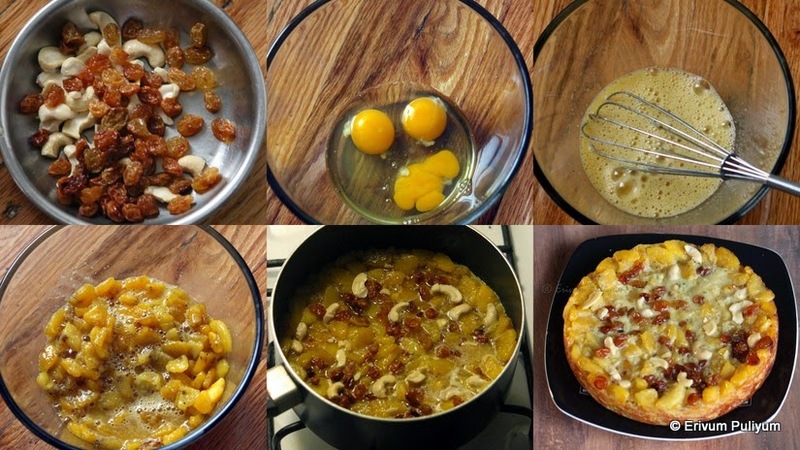 Kaya Pola | Egg-Plantain Cake(Step by Step Pics) & New Year Wishes !! A fresh start and another blank page in life to be written.New questions to be asked,embraced and loved.We can help write that book by setting goals,ryt? How many of you take up resolutions for New Year? I personally have stopped taking them after college as none of my resolutions go beyond the first month and may be I can call it a 'January resolution' too.I found one resolution interesting & meaningful(when someone posted) and that everyone can practice in their everyday life.The resolution is we will be there for one another as fellow members of humanity,in the finest sense of word.I hope each one write a good 365 pages book taking up the challenges and grabbing the opportunities.Wishing all a very happy & prosperous New Year !! Starting off this year with a Malabar sweet snack,Kaya Pola(Egg-Plantain Cake).This is made with eggs and cooked ripe plantains,makes a filling after school snack for kids.Kids would definitely love this and ask for more.Do give this a try & enjoy. 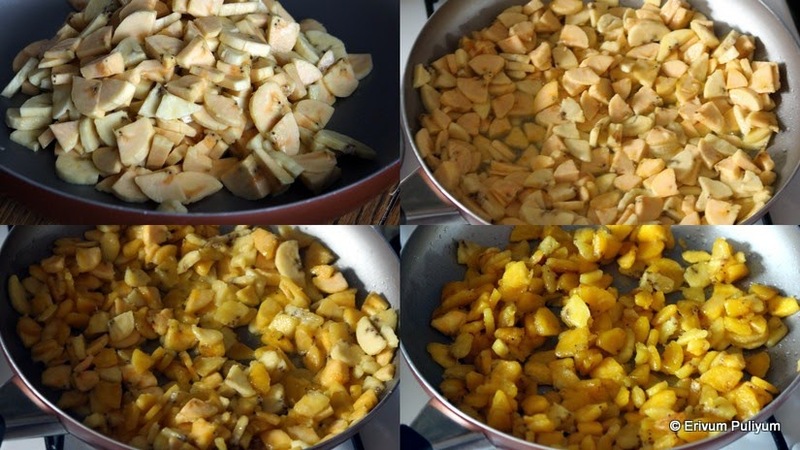 Peel the plantains and slice it in thin quarters,Keep aside.Heat a non stick pan and add oil/ghee or mix both.Add the sliced plantain and saute until its cooked well.Add a tsp of sugar to the mix.Put off flame and let it cool. Crack 3 or 4 eggs in a bowl and whisk well.Add in cardamom powder and sugar,mix well.Add the cooled plantain mix in it. Heat another pan (preferably a non stick and deep pan like sauce pan) and add the ghee.Add in the cashews,fry well.Drain in a plate.Add the raisins and fry till golden.Drain again in the plate.Mix half of the raisins and cashews in the egg mixture(reserve remaining for garnish). Now,spread the remaining ghee in the pan on all sides and bottom of the pan well so that the kaya pola leaves the pan easily.Pour contents in the pan and spread evenly.Garnish the remaining cashews and raisins on top.Cover and cook on very low flame for 15-18 minutes until tooth pick or knife inserted in the center comes out clean.The sides and bottom gets golden color. Invert on a plate or slide on a plate.Cut and serve when warm. * You can add four eggs depending on the size of eggs. * You should wait for the cooked plantain to cool completely before adding to the egg mixture else the egg will get cooked. * Adding ghee adds more flavor and taste.But a mix of ghee & oil also works good or oil alone too. * Ideally plantain should be cooked in ghee for authentic taste but here I used oil just to cut off excess calories. * Add vanilla extract if not using cardamom powder. * If you don't have a deep non stick pan to cook kayapola then pour the mixture in a pressure cooker greased with ghee.and remove the weight from lid.Close and cook the same way as above.And you can also use steamer to steam cook the kaya pola by pouring the contents in a greased plate and placing it in steamer. Looks yumm!! here plantain you mean the raw bananas which are just turning ripe? little sweet yet raw? This looks so tempting, no eggy smell I guess? that's why i like to use Eggland eggs only. kothippichu ketto.. feel like taking it out right now:) yumm..
Cake looks very delicious and inviting. Happy new year to you and your family. Looks yummy. A perfect recipe to start the New Year. Delicious I was planning to make if for long time. happy new year to you and your family. Very nice...each of your recipe is so good! What a great post for a New Year! Delicious..
Looks so delicious dear.I would love to have a big slice . Happy New year..
Hmm...never tried and had it before. But it looks delicious. I have few ripe plantain in my pantry. I will give it a try.